If you are looking for an in-home solution for a low impact exercise program, jogging, running or a more intense cardio workout, the Sole treadmills could be your answer. The Sole F65 has programmed routines, a cooling system and an ergonomic design to keep you moving faster, longer. Let’s find out the details. Who is Sole and What Do They Do? What Makes The F65 Treadmill Unique? Treadmills have long been a staple in any cardiovascular workout routine. When they were first released, people were skeptical of their use liking them to a hamster on a wheel. Over time, the benefits became well established and documented in research, fitness and medical journals. Today, treadmills are more advanced and can be found in homes across the country instead of just in the local gym. Sole makes treadmills designed for home use for those that want to push themselves. Unlike those original models, the Sole F65 treadmill comes equipped with features and options that previous generations could only dream about. Is the Sole treadmill right for you? This article will examine the company, the product and how it is received by the public in an attempt to answer that very question. Let’s take a look at the details and find out if the F65 belongs in your home. For over 30 years now Sole has been providing exercise equipment to the public. When the company first started they found a consumer niche in the hotel fitness room industry. Their reliable customer service and rugged, durable machines found their way into more and more fitness centers around the country. As visitors to these hotels soon found out, the machines were better built and easier to operate than the machines they were using back home. It wasn’t long before the private demand for Sole treadmills catapulted the company into the private sector. The rest, as they say, is history. Since then Sole has grown to provide the three basic exercise equipment machines needed for a full workout: treadmills, elliptical machines and exercise bikes. The F65 is no different and stems from a long line of treadmills, each improving upon the last. With a team of engineers dedicated to creating the best, most durable and user-friendly treadmills around, Sole has pioneered and spearheaded many of the features you find standard on other machines today. In the last decade alone, the company has grown to reach overseas with an international department that spans the globe. Not only will you find Sole equipment in your home, your local gym and when you travel within the states at hotels and fitness centers, but you will find them in almost every other modern country on the planet. While they have grown to include elliptical machines and exercise bikes, the treadmill is where they started and is still their bread and butter machine to this day. Extra care and devotion go into each new model, and the F65 is no different. Modern features such as a high-resolution display, programmed workouts, and adjustable incline provide some of the toughest routines you can go through. Several things stick out when it comes to a Sole treadmill and the F65 among them. The construction of the treadmills is quite fascinating and not for the faint of heart. The welded steel frame is virtually bulletproof. Not that you’ll be taking it to the gun range, but you probably could. The durable construction and rugged motor keep the machine operational for years without worry of breaking down or wearing out. The motor itself has been engineered to withstand long running cycles and perform at a constant speed. You can set the speed of the motor anywhere from half a mile per hour to an incredible 12 miles per hour. Depending on your fitness level, and the challenge you want to tackle that day, the F65 has you covered. If you are looking for a steady workout, you can follow one of the 15 programmed routines that will keep you moving, sweating and your heart rate constantly elevated. Each routine varies in endurance and speed. Mix that with the ability to adjust your incline, and you have a workout that will have your blood pumping and heart racing, in a good way. Another unique feature is the higher weight limit. While most treadmills designed for home use have a high-end weight limit of 250 to 275 pounds, the F65 allows weights up to 350 pounds. If you are a beginner and looking for a cardio workout to start losing weight, the F65 is for you. It doesn’t end there, though. If you rely on fitness apps on your smartphone or tablet, the F65 has Bluetooth connectivity to allow you to continue using those programs while on the treadmill. You can utilize the bright, backlit LCD screen and even plug in your MP3 to listen to your favorite motivational music or audio book while you run. The F65 also uses a wireless chest strap so you can keep an eye on your heart rate without having to worry about being tangled and plugged in. Gone are the days of having to answer the door or phone and forgetting you are plugged into the machine. We all know that treadmills aren’t cheap. Better construction and better features usually mean a higher price tag. However, with the Sole treadmills you get high quality, durable construction and reliability all at a pretty affordable price. The F65 has a suggested retail of about $$, which is a decent price in its own right. However, through the Sole website along with other third-party vendors such as Amazon, you can find a new machine for as little as $$. In comparison, other treadmills of similar ruggedness and feature abilities will run you $$ per payment, with multiple payments involved. As newer models are released, the price of the F65 will continue to go down as well. Currently, there are three newer models, culminating with the F80 which has driven the price down several hundred dollars on the F65. While we aren’t advocating you should wait to get started, if you find yourself purchasing a newer model is being released, it may be beneficial to wait an extra month or two to take advantage of a discounted price tag. Sole treadmills are industry leaders, and there are more than several instances of proof for this. 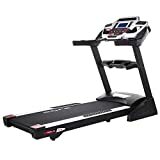 As a whole, the treadmills of the Sole brand have received numerous best buy and top fitness device awards, 15 in total. Of those, the Sole F65 treadmill has won a couple. It isn’t just about what the machine can be awarded it is more about what it can do for you and how you feel about using it. A machine can win every possible award, but if the results don’t show up in your living room or basement, the awards don’t mean a thing. According to the reviews of people who have already purchased and used the F65, the awards are well worth it. People write in all the time complimenting the F65 on its durability and its stylish looks. The little amenities are what drive people to make the purchase, such as the dual cup holders and cutouts for tables, books or smartphones. The wireless chest straps are also highly rated for their accuracy and ability just to work when used. The results speak for themselves though. Weight loss increased energy and fitness levels and clean bills of health from doctors have all be attributed to the Sole F65. Sole may not yet be the most popular household fitness name, but it should be. Those that do know about the name and use the equipment have very little bad things to say. The bad things that are said are generally compliments in disguise, with such things as the user not able to keep up with the machine, or that the workouts pushed them too hard. In an effort to better your fitness level, you will have to push yourself, and the F65 treadmill does just that; it allows you to push yourself. We have been on hundreds of exercise machines both at home and on the road. Sole is a name we are familiar with just from staying at a hotel while traveling or by visiting our local gym. We know that the treadmills are highly durable and can withstand constant use by several individuals day in and day out. Because of this ability one or two people in a household using the machines several times a week will mean nothing to the high-quality components. When it comes to longevity and quality, Sole is hard to beat. We have been on treadmills that don’t hold up or that seem sluggish after a year or two of use, especially in a gym environment where they see constant use and abuse. However, no matter the time of day or the location, every time we have stepped on a Sole machine it was as if the machine was brand new and we were the first ones on it. Even getting on models that were years old and have spun several hundred thousands of miles, the machines never quit, whimpered or acted as if they were wearing down. A true testament to the brand is knowing that fitness centers around the country rely on their rugged durability and ability to keep on performing at a high level. Sole is a name that you are happy to see when traveling. You know as soon as you walk in and see the brand moniker on the side of the machine that it is just going to be there and work for you. You won’t have to worry about the motor being sluggish to the controls being unresponsive. As soon as you step on and power up, the treadmill is ready to take you on your journey for the day. While an actual, physical coupon may never be found, the deals for the F65 are numerous. There are physical dealers located around the country ready and eager for your business. Whether you need a single machine for your private workout space or a dozen for your fitness center, you can find a deal. Many local dealers will ship the treadmills for free. You can even find deals that pay the sales tax for you. If you buy in bulk, you will often find a discounted price on the bottom line. Even buying a single machine for your own use will come with a great deal. Free shipping is almost standard now, and discounts are found in almost every online vendor there is. Even on the company’s own website, you will find discounts, money taken off or introductory specials. If you are looking to save money, you can check out the Sole blog or social media pages and keep up to date on their offerings. Otherwise, head to your local dealer and ask about any on-going specials or visit an online vendor such as Amazon where you can get expedited shipping for a lower cost or an extension on the warranty for much cheaper than anywhere else. The deals are out there if you are willing to do a little research and comparison shopping. The Sole F65 treadmill is not a one-of-a-kind machine, but it is a one of a kind brand. The level of detail that goes into making a Sole treadmill is unsurpassed. The F65 takes advantage of decades of engineering and development. Even being a few years old it isn’t outdated technology. The use of Bluetooth connectivity and the bright LCD screen are still not even standard on most machines being built today. Whatever your need for a treadmill may be, you can accomplish it with a Sole F65. From losing weight to training for the next marathon, the F65 has you covered. Step on, power up and start running, the machine will do the rest.